Cyclists can hop on a bike and take a spin down the Royal Canal tow path or follow the Mullingar Cycle Route which has three options listed below, all of which take in the beautiful countryside around Mullingar, County Westmeath. This moderately hilly route makes a circuit of scenic Lough Owel. Once cyclists have left Mullingar past the hospital, rolling hills take them along the westerly slopes of Lough Owel. They’ll have a choice of refreshment stops at Bunbrosna, Multyfarnham and Ballinafid. A short section of the busy N4 must be negotiated where cyclists can stop to visit Lough Owel and take a swim. Return to Mullingar along quiet country roads. 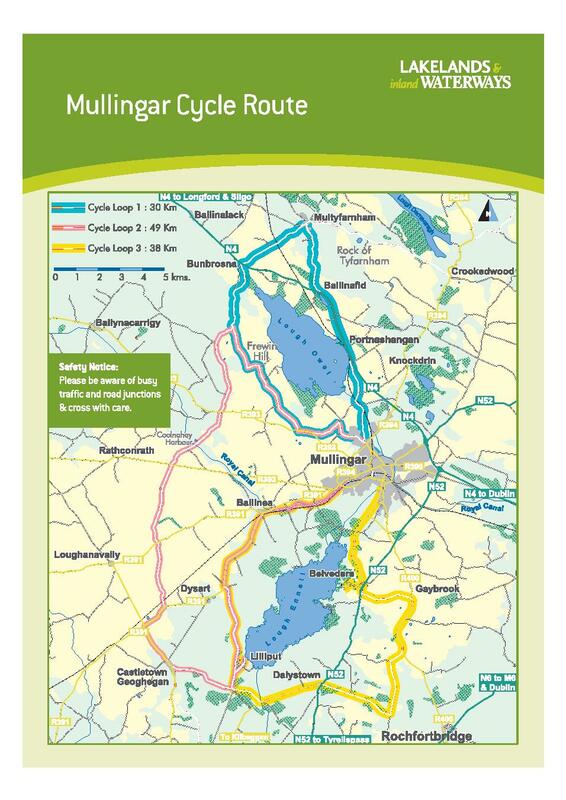 This is the longest route and makes a tour of the countryside between Lough Owel and Lough Ennell. Cyclists should start by following Loop 1 until they pass the high point of Frewin Hill. The route then takes a southerly direction along quiet roads and lanes, crossing the occasional main road. A good place to stop is at the pretty Coolnahay harbour on the Royal Canal. Continue on to Castletown Geoghegan, the route then visits Lough Ennell at Lilliput. Return is via Loop 3 to Ballinea with the final stretch along the very pleasant tow path of the Royal Canal. This good half days exercise makes a circuit of Lough Ennell with opportunities to visit the lake at both Lilliput and Belvedere. The Royal Canal makes a loop through Mullingar town centre, passing the railway station. Cyclists should start here and follow the banks along a good track for nearly an hour to reach Ballinea. Quiet rural roads then lead to Dysart and the Jonathan Swift Park at Lilliput on the shores of Lough Ennell. A good stretch of level wheeling will then take cyclists on past Dalystown and through bogland. Descending from Gaybrook, cyclists cross the main N52 and then detour into the elaborate grounds of Belvedere House.